One of the United States largest Communication Service Providers has selected DonRiver to provide a multi-platform inventory federation for their Metro Ethernet network and service inventory. Federated inventory is a term used to describe the collection of network and service inventory from multiple sources and presenting it in a consolidated way. The approach is gaining significant adoption within the OSS industry as CSPs continue to struggle with user acceptance and the overly complex Commercial off-the-shelf (COTS) inventory solutions. We’re seeing a significant amount of interest in our solution from CSPs all over the world. They’re all struggling with the same problems – the inability to decommission legacy systems, end user frustrations with inflexible COTS inventory user interfaces, poor system performance, the list goes on. 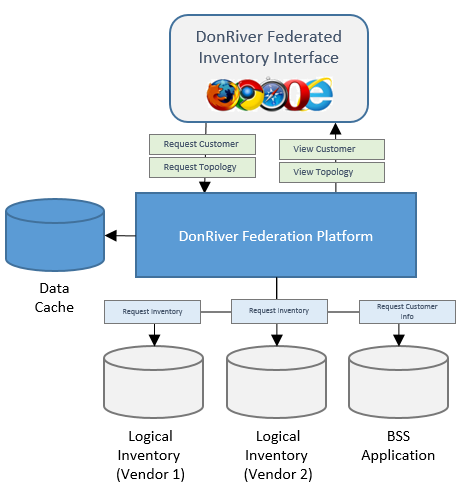 The solution, built using DonRiver’s Federated Inventory Platform, combines sources of network and service inventory from multiple industry leading COTS inventory platforms and then federates (or merges together) the data into DonRiver’s user interface, which provides a significantly better user experience over the generic, one-size-fits-all interfaces currently in place. DonRiver’s platform provides the CSP planners, engineers, field technicians and operational support staff task-orientated and innovative new functionality – including sophisticated network topology diagrams, flexible reporting and an ease of use not found in other platforms today. No CSP can escape the fact their data is distributed across a number of specialist OSS and BSS systems; be they legacy, next generation or custom built. Real time consolidation of this data into DonRiver’s Federated Platform not only improves end user experience but gives the CSP’s IT team options to migrate away from legacy systems in a gradual manner with no end user impact. Deployed into production in early 2014, DonRiver’s Federated Inventory Platform supports over 500 users across the country, including design, provisioning, test and turn-up and numerous operational departments. The product supports full read and write functionality to leading COTS inventory platforms and is supported across all major Internet browsers. And if you want to read more about inventory federation check out this month’s CIO Review magazine, page 31, for an interview with DonRiver co-founder Kent McNeil. For further information regarding DonRiver’s Federated Inventory Platform, contact Greg Schneider at greg.schneider@donriver.com. Learn more about DonRiver in the OSS Line Directory.